This modern vacation home was built in 2012 in the traditional style of the region. 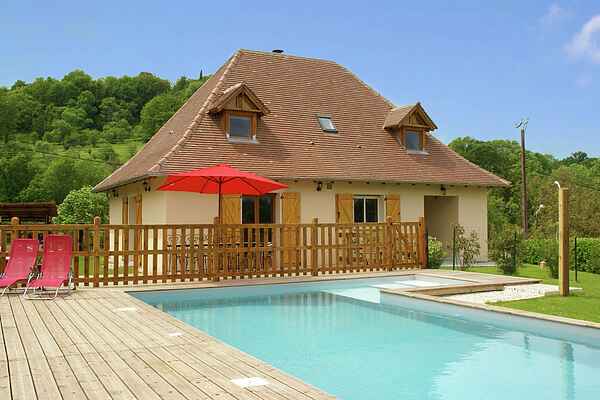 It is situated in a tranquil, little hamlet about 4 km away from the fun town of Loubressac. You have a fenced, well-maintained garden and a lovely terrace facing South with furniture and a stone bbq at your disposal. Take a dive in your own private pool and enjoy the beautiful surroundings afterwards while laying under the umbrella of your lounge chair. Indoors, the interior is well-maintained and modern. The house is equipped with all conveniences like a rain shower, Senseo (coffee) machine and a nice fireplace. There are plenty of sights to be seen. You should, for example, go visit the magnificent caves of Padirac (10 km), where you can take a boat trip under ground. The beautiful castle of Castelnau (7 km) is also highly recommended. And of course there's the river the Dordogne, only 2 km away with lots of options for swimming and the canoe rental, for example at Carennac (6 km). Visit the fun local market of Beaulieu-sur-Dordogne (14 km, wednesday and saturday). A glance at the map teaches us quickly that there are lots of great places to explore; the picturesque Rocamadour (23 km, also known as monkey forest), the red stone village of Collonges-la-Rouge (27 km).